You can tell a lot about what a culture values by the signage you see along their streets. At home, in Oregon’s Willamette Valley, the most common signs are commercial in nature, alongside church reader boards and, in the right season, snazzy vinyl political placards endorsing candidates or ballot measures. 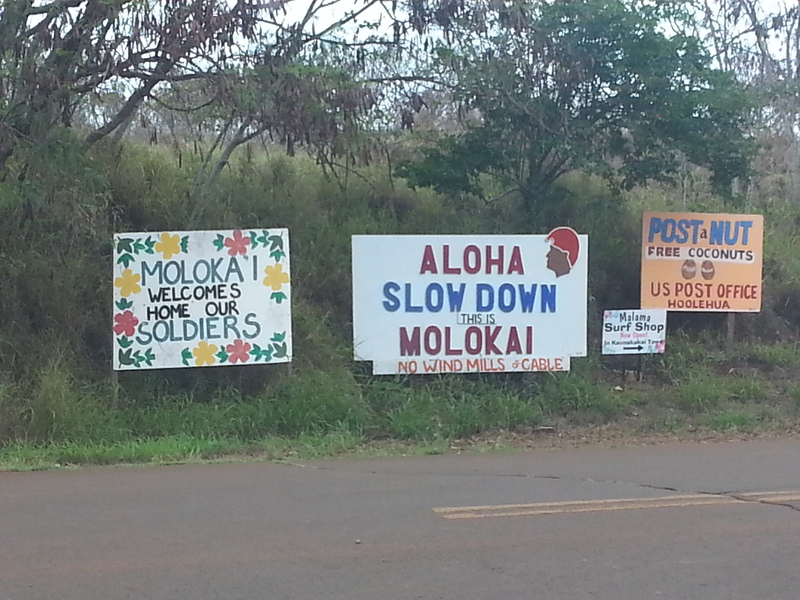 Actually, these combined signs outside the airport are an interesting Molokai primer. In my three weeks on this island, I’ve endeavored to capture the signs I’ve seen along forty-plus miles of highway from the west end, where I’m staying, to the east end at Halawa Valley. I wanted to learn what issues were important to the makers of these signs. As a result, I’ve read a lot or articles online and talked to some well-respected residents who hold a wide variety of opinions. Although my research has been an absorbing pastime, I want to be clear: I am an outsider. I respect this community immensely, so the opinions here are mine alone. My observations are only my interpretation of issues that run deep in the hearts of Molokai’s people. But I want to share them with you with mahalo (respect). The night Mary arrived, we sat out on the lanai on a wide, bed-like lounge to watch the sunset. As it became darker and stars began to appear, I also noticed a glow in the sky. “What is that?” I asked Mary. “Oh. . .” I love stargazing and hate light bleed. Westerners are a people living in terror of the night. We light up the sky thinking it makes us safer when studies show illumination actually increases night-time crime. Our fearful lighting throws migrating birds and marine animals off course, sometimes to their death. Instead of walking toward the sea, confused baby sea turtles hatch and walk toward lights pointed at the surf. It’s a major peeve of mine. Rant aside, it’s my belief this distant glow in the sky touches the hearts of the people of Molokai in warning. The can see — plain as day — what has happened across the channel on Oahu. They are passionate about preserving the Hawaiian-ness of this beautiful island. The signs I saw tell a story of how they’re trying to do that. This one reads: How many ships do you see? 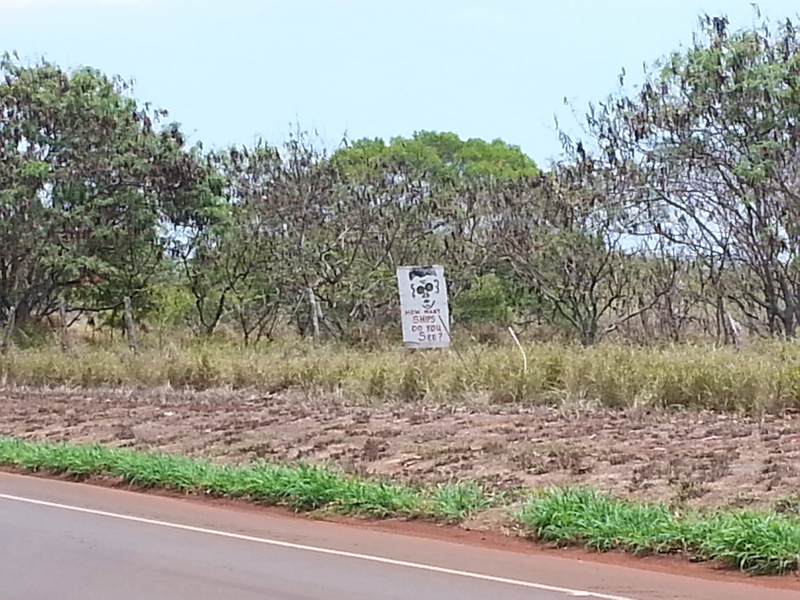 This sign — and the similar “No cruise ships” ones I failed to capture — is a protest of cruise ships at Molokai. The concern is that if the small operator is allowed to land (which is the current proposal), it will open things up to the big ones. An island overrun with day-trippers does not fit with Molokai’s vibe. Currently, there are a few inter-island flights from Maui and Honolulu which bring visitors and residents here each day. Although I see vacationers zipping around in their rental cars to local attractions, they are the minority by a long shot. Like most human reactions to issues everywhere, there are polarized stances from “absolutely no, never” to “yes, absolutely”. What I find remarkable is people of differing opinions seem to be willing to talk to each other and respect one another’s views — a talent most of the mainland US has lost — even on this hot topic. Within the spectrum are more nuanced perspectives about the number of visitors to this island, environmental impact, long-term land development, and economic development. Lots of young people leave the island for work — either on more populous islands of Hawaii or to the mainland. I meet a mom whose adult son has just taken a job on Maui, and the tears in her eyes tell a story. A community needs its young people. In other words, this issue is a lot bigger than the one ferry that wants to land here. It’s causing community-wide discussions about fears, desires, and the hopes of the people of this island. Open conversation can lead to good things. Just beneath the Slow Down sign at the airport, an added board reads “No Windmills No Cable.” While the cruise ship signs made sense to me, I had to dig to understand this one. Thanks to the trade winds, Hawaii is blessed with a constant source of potential power. But like many communities the world over, people resist the look of windmills punctuating their beloved — even sacred — mountains. To me, it seems the issue goes back to that glow in the sky we noticed from our balcony. The power generated by proposed windmills on Molokai would be sent by undersea cable twenty-five miles to Oahu to fuel their electricity needs. Here’s where the differing desires of sister islands becomes apparent. If I had a seemingly-greedy sibling, I would feel resentful if she wanted to siphon off my resources. 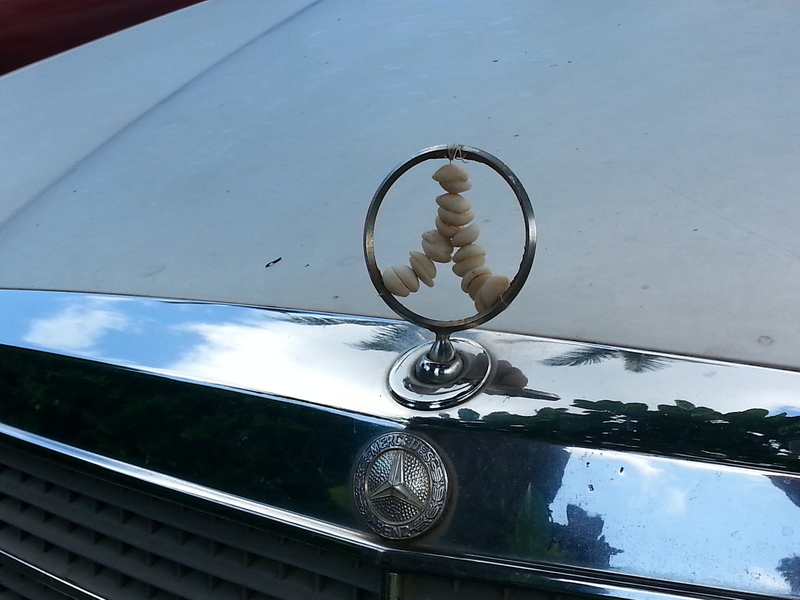 I think that’s where some of Molokai’s resistance comes from. A principle is at stake. Here’s a decent article on the topic. Although there’s no signage to go with this issue, crowds carrying signs were once quite visible around a heated land-use conflict. In the late 1800s, an entire third of Molokai was sold to a ranching company and is still held to this day. This is staggering to me. From what I’ve read and heard, it seems fewer events in recent history evoke such strong feelings among residents than the actions of Molokai Ranch and its parent company, Molokai Properties Limited (which is, in turn owned by Singapore-based GuocoLeisure). When local protests erupted over a proposed development of 200 multi-million dollar homes, the ranch was shuttered and over one hundred people lost their jobs. As the island’s largest employer, this had an immediate impact on the island economy directly (from salaries) and indirectly (fewer visitors to the island using other services). In May of this year, an announcement was made that hotels on ranch lands would be revived after being closed since 2001. Here’s what doesn’t add up to me: when I read this 2008 LA Times article, I learned that the company ran at a dramatic loss for six consecutive years before closing (yet blaming local resistance for the closure). Their snazzy website makes a good case for sustainability and supporting the island’s economy. What isn’t clear yet is how this historically unprofitable venture will become economically feasible without selling out or changing the essence of this quiet island. The fly in the ointment? The Ranch is where the wind project would be located. It’s a head-scratcher. I’ve grown to love this island, and its future interests me. I don’t have a dog in the fight, but the more I’ve learned, the more I’ve pondered possible solutions. I wonder if the land could be sold to the Nature Conservancy, which might solve the Ranch’s possible cash-flow problems. 70,000 acres is a lot of property to hold without it being profitable. Especially since the consensus is against further development. My thoughts have also wandered to other islands with something precious to preserve — like the Galapagos. I wonder how that island sanctuary keeps their economy healthy while at the same time restricting visitors. Does every island sell out to the developer/expendable-income crowd? If there are notable exceptions, what are those communities doing to stay vibrant? In my heart, I believe appealing ways to meet many needs exist without Molokai becoming another Waikiki. I referenced this sign in a previous post, but I had to just share the real thing. It’s posted on the door of Friendly’s Market, the main grocery store in Kaunakakai, Molokai’s biggest town. To me, it’s a funny, friendly way to say, “If you come in here, don’t be a jerk. We still love/respect you, but settle down first and come back later.” Imagine if every grocery store had one of these on their door! In conversation, a local resident used the word aloha as a verb. I hadn’t heard this before. “You have to aloha everybody,” she said. “Even if they don’t aloha you.” The people of Molokai, in my experience, live this phrase. Their continued commitment to living sanely is an inspiration in our crazy world. The aloha of speaking their values, listening to elders, and being cautious about wasteful development of sacred land is something Western culture would do well to emulate. 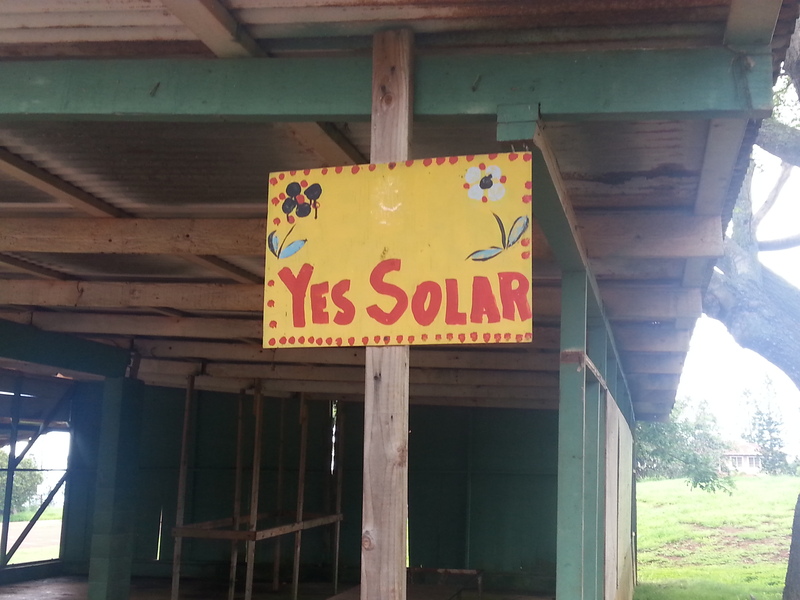 As a visitor, I haven’t earned the right, but I’d love to make a sign: May Molokai’s aloha result in solutions that help their community thrive. I so loved your paper, Jennifer. Thank you for sharing all that. I love your outsider concern and, thanks to you, I know some issues of an island i didn’t even know it existed. Keep on like that and I will be an eager reader.